With the arrival of Obamacare, millions of uninsured Americans are entering the healthcare system for the first time. As these new patients happily stream into waiting rooms, doctors are scrambling to keep pace with the increasing demand. Preserving a high standard of care amidst the waiting room blitz requires greater efficiency from medical practices, and doctors are desperate for solutions that can help relieve some of the pressure. 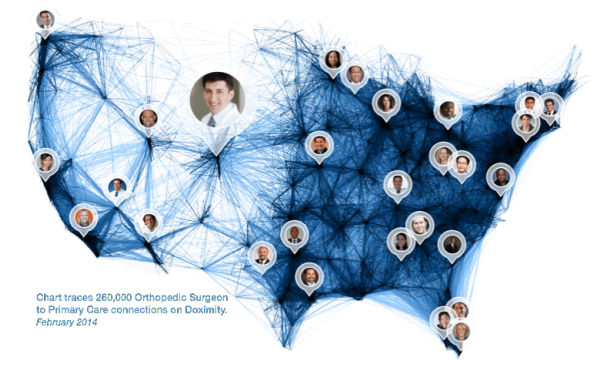 By making it easy for doctors to connect and communicate across teams, hospitals and entire health systems, Doximity wants to provide a release valve for the nation’s M.D.’s. The San Mateo-based company launched in early 2011 to give medical professionals a free, HIPAA-compliant alternative to LinkedIn and it’s been growing like a weed ever since. That’s partly because Doximity has been working to transform itself from a social network (and a vertical-specific version of LinkedIn) into a platform. Today, Doximity serves doctors as not only a professional network and profile page, but a way to find relevant specialists for patients, a rolodex, a CME tool, a news portal, an email and text service, and a virtual lounge. 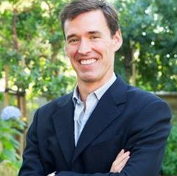 Founder and CEO Jeff Tangney wants the platform to become a utility for healthcare professionals and doctors, and one that helps them get things done by turning to physicians in its community to help it make product decisions. Doximity isn’t Tangney’s first time on the HealthTech merry-go-round, having founded and acted as president and COO of mobile health software applications giant, Epocrates. However, with the medical social network’s announcement today that it now reaches 40 percent of U.S. physicians — some 250,000 of them — the demand (and support) for Doximity among the nation’s M.D.s comes as a surprise even to Tangney. In an exclusive interview with TechCrunch, the Doximity CEO stopped by to offer a little insight into how the startup has been able to reach the tipping point and what’s driving this growth, as well as a peak into the company’s plans for the future. Doximity may be growing fast, but let’s back up a bit, why wouldn’t doctors just use LinkedIn or Facebook to satisfy their professional networking needs? How has Doximity been able to differentiate itself from the bigs and provide more value for doctors? Well, it starts with the fact that being a doctor just isn’t a normal job. I mean, what other career requires nine years of post-graduate education, a full Latin lexicon, and to swear an oath? So there’s quite a bit that’s different about our site — like HIPAA-privacy, specialty forums, research alerts, medical education credits, and so on — from the familiar names in social and professional networking. But I’d say the main reason we’ve grown so fast is secure email. I can’t imagine doing my job without email, but in fact that’s what we ask every U.S. doctor to do. It’s a little crazy when you think about it. So now that you’re at 40% of U.S. doctors, tell us how you guys got to the tipping point? We’re seeing that tipping points really happen by sub-market. In our case: a hospital, a city, or a specialty. Each is a little different, but it’s that magic point where folks in a pre-existing social or economic group feel “left out” if they’re not on it. 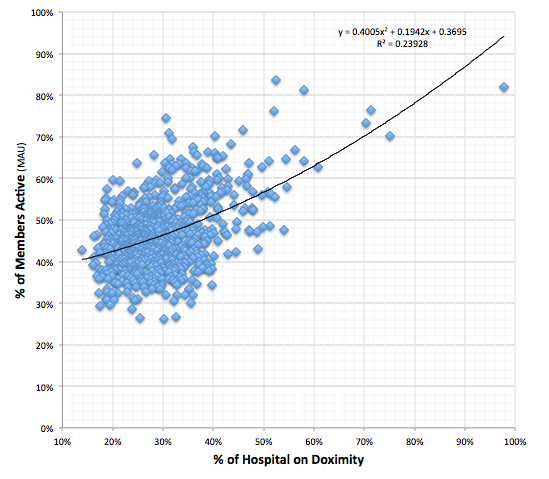 The chart below shows Doximity coverage and usage for the top 1,000 hospitals in the U.S. Not surprisingly, the more doctors we have in a hospital, the more usage we get from each. It’s network effects and Metcalfe’s Law in action. Also, not surprisingly, the smaller markets tip first. For us, it was Alaska. Doctors on the Alaskan north slope needed specialist input but often lacked the time or money to medevac (fly) their patients hours away to hospitals. So they started using our mobile app to find other doctors and send secure photos. Since there are only 1,500 doctors there, it took just a few months to hit critical mass. Even today, it remains one of our most active states. I think some people would be surprised to know that Doximity is just as much of a platform as it is a social network … What are the core use cases that are able to extend Doximity’s functionality? What is it that doctors really want? Is it to socialize and connect with peers, or is it educational materials, or email, fax and SMS services? Yes, the platform piece has been really cool. We’re over 75 partner sites that now use our OAuth “Login with Doximity” button to verify physicians. It’s made it easier for docs to verify and credential themselves with all these great new health services that are sprouting up. As for the rest of our usage, I’d say our patterns are broadly in line with that of LinkedIn or Facebook. Surfing the “medical graph” via referral searches, viewing profiles, reconnecting with past colleagues is primary use. About 25% of our doctors regularly use our secure messaging (including our free eFax) and 1 in 3 uses our CME and research alert tools monthly. Are doctors actually involved in product development and, if so, how? My entrepreneurial life began by listening to my physician roommates at Stanford, and 15 years later at Doximity, it’s still what I love to do. We have 5 doctors on staff, plus advisory boards, monthly and annual physician meetings…a lot of our energy is devoted to truly understanding what doctors need. Related to the two questions above: How do you increase engagement for doctors, and encourage them that Doximity is something they want to use? Doctors are super busy, so speedy, well-designed features are key. Like a lot of startups, we do a lot of split testing. We even take it a bit further by running internal contests — e.g., we had two data science teams square off to A/B test a “people you may know” algorithm. The winners got cushy new office chairs and the losers had to “peacock” (wear costumes) out to a karaoke bar. We seek a lot of live feedback, too — an annual weekend with doctors, monthly dinners, and such. Some of our best ideas have come from just listening to doctors talk over dinner. Some of our best ideas — like continuing medical education credits, referral templates, efax, hospital ranking surveys, and online schedules — have come from these sessions. Is the growth of Doximity playing into any major trends we’re seeing across digital health? What are the big factors driving adoption of Doximity and digital health as a whole? Over the last five years, about a third of doctors have moved from private practice to working for hospital systems. Obamacare is accelerating that shift. This is changing the way doctors communicate and the way they think about their careers. We’re here to help them through these shifts, and to optimize communication with their colleagues and patient care. Broadly, this is part of the large trend towards more transparency in healthcare, both for patients and providers. What’s next for Doximity, business-wise and product-wise? With nearly 40% of physicians on Doximity today, we’ve got some big ideas, but nothing we can discuss publicly yet. Let me just say that we believe we can further the wisdom of medicine, both collectively (new treatments) and collaboratively (patient-level). How has LinkedIn’s success/expansion — particularly its move to become a content network for professionals — influenced your direction? Do users see Doximity as a doctor search engine — the main use case for many when it comes to LI? Like LinkedIn in the business world, we are the “profile of record” for most doctors. And if that’s all we did, we’d be pretty pleased because medicine really needs a master directory for us all to more easily find niche experts, navigate insurer networks and such. On the content side, we tried a research alert service last year and it’s gone pretty well, so we’re now rolling it out to all specialties. The core idea came from a doctor at one of our dinners. Like about half of US doctors, he’d authored published research, in his case on a rare aortic disease. Others had cited his research, but he’d have to go search the National Library of Medicine every month to find out who. So we started sending alerts now able to alert 70,000 doctors each month that new research has cited theirs. In addition, we let him contact the other doctor to collaborate, and that’s led to. Keeping up to date with new medical literature is a part of a physician’s job—but so is tracking publications, sending secure messages, getting referrals and planning a career path. A statistic that we found particularly concerning is that the average time that a specialized new medical innovation takes to diffuse across the United States is 17 years. For the right new treatments, we think that number should be 17 days. How digitally savvy are doctors and medical professionals? There’s a lot of conflicting info out there … Are they really ready for this kind of service at a broad scale? Contrary to common perception, I think doctors are actually very digitally savvy, especially when it comes mobile. They may not have desks, but 90% of them own smartphones. And before most of us had even heard of apps, they were downloading my last startup’s product (Epocrates) which allowed us to be the first mobile app IPO ever. Part of the problem is Health IT software. It’s designed for the hospital accounting department first, and the doctor second (or third if you include regulations). So you’ll hear doctors complaining a lot about computers, but really they’re complaining about the software. And they’re right. The software they’re forced to use is pretty awful. How does Doximity make money? Are you cash flow-positive? How do you make money but keep the service engaging without scaring potential members? What’s the growth rate look like on the biz side? Our business model really parallels that of LinkedIn and we‘ve seen strong growth on the recruiting side this year. We now have over 200 hospitals and health systems as clients. In fact, there’s big news here: With 52 people on payroll and a year ahead of plan, we just finished our first cash flow-positive month in January. We’re growing our team to keep up with demand and are about to double our office space in San Mateo. So how is Doximity helping recruiters? And how do you make sure it doesn’t become a spamming opportunity for recruiters, and something doctors want to opt into? That’s a great question. We worry about that a lot. Unlike LinkedIn, recruiters on Doximity are required to name their proposed salary up front. That rule, combined with filters that doctors can set to be very specific about the job type, title, call duty and location they’re interested in, makes the experience very relevant to busy physicians. Our click rate on recruiter messages is over 24%. Doximity is a huge step ahead of the current system of medical recruiting. Doximity has been a “mobile-first” company since the very start. Mobile was already the hot technology for doctors when I founded Epocrates back in 1998, it’s only grown more important in a doctor’s daily workflow since then. Since most doctors go from exam room to hospital room and back to another exam room to see patients, and don’t sit at a desk in an office, mobile is really the best tool for them. We make it easy for them to stay connected to their colleagues and to transfer patient information without needing to log onto a desktop computer.